BV Lawson's varied career background includes maid, super-speedy typist, classical musician, radio announcer, being in TV commercials (for all of one day), research assistant, TV features writer and working for the Discovery Channel for over a decade. Now a full-time freelancer, she's penned articles for various publications and won awards for her many published stories and poems. Thanks to the influence of library genes handed down from her mother, she created the blog In Reference to Murder which contains over 3,000 links for mystery readers and writers. She's working on a series of crime fiction novels set in various locations in and around the mid-Atlantic featuring crime consultant Scott Drayco, and when time permits, BV and her husband enjoy flying over Northern Virginia and the Chesapeake in a little putt-putt plane. Visit BV via her web site, bvlawson.com. No ticket required. 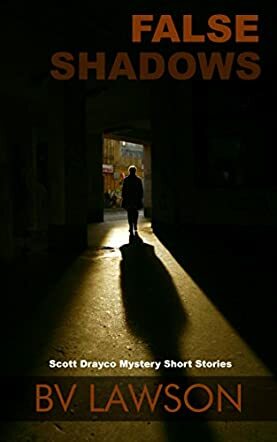 “False Shadows” by B V Lawson is a fine collection of eight short stories, three of which have been published previously. A common thread running through each of the stories is the main character, Private Investigator Scott Drayco. Drayco is unusual in that his life goal had been to become a concert pianist, until a botched car-jacking ruined one of his hands. After that forced a change in plans, he enlisted with the FBI, trading in his badge for a P.I. license when he grew tired of FBI work. Drayco is an adept investigator, solving his cases in a very Holmesian style, where logic and insight replace solid evidence and physical clues. Each of the stories in this collection is noteworthy, some more so than others, but all are good. Lawson had sampled an eclectic variety of potential careers, until she found her niche in writing fiction. She is remarkably proficient at developing pragmatic and intriguing histories for the characters in each story, thereby adding an additional element of realism and authenticity to the whole. This proficiency undoubtedly results from her diverse background. She also has an aptitude for ending her stories with an unexpected twist. Her prodigious ability to merge each of these talents into a short story is nothing short of astonishing; it would ordinarily seem to require a much longer narrative for most authors to develop this much depth in their stories. “False Shadows” is a collection of short stories you will not want to miss. Each tale in the collection is worth the time you will spend for it.